Reaching University: An Inspired Goal - Cufa - Learn more! Pisey Chhom is a fifteen year old girl living in Svay Rieng province. She has been lucky enough to learn a range of financial literacy skills in a fun and engaging way through Cufa’s Children’s Financial Literacy program. 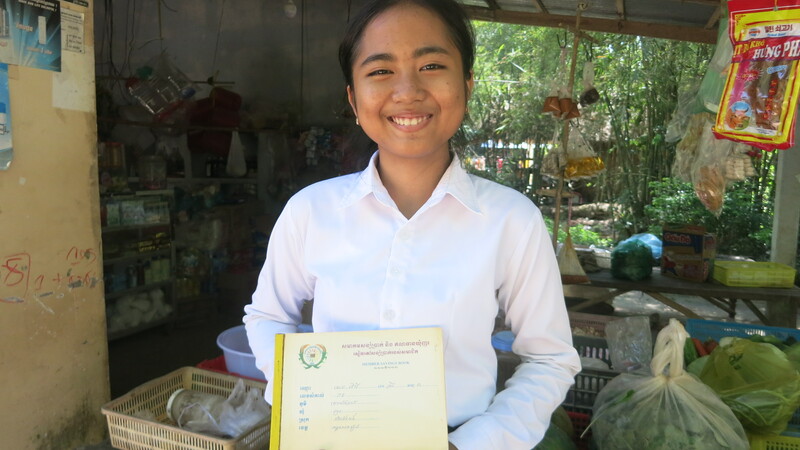 Pisey hopes she can use her knowledge from the program to help her achieve her goal of reaching university! She is part of a large family with two brothers and a sister along with her parents who work selling groceries in their store. Pisey is currently studying in grade eleven at her local high school which is a ten minute bicycle ride from her house. The dream Pisey currently has is to become an engineer and thus she is studying all science related subjects as part of her education. Previously, Pisey paid little attention to saving her money. She received a small allowance of 1000 riels ($0.35) a day to take to school. This would usually be spent on snacks or toys as Pisey have any savings goals. She started working with her parents in their store and began to notice how hard they would work. In addition to working at the stall, her parents also sold much of their produce at the markets including the chickens and pigs that they farm. Four years ago Pisey joined the Children’s Financial Literacy program and learnt a range of savings skills that will help her later in life. She asked her mother to buy her a piggy bank which she started using religiously. Now Pisey earns more money thanks to her work tutoring younger students and busking. She is able to use the savings skills that she learnt from Cufa project officers and has been able to save up for some new stationery and study material for school and even a bicycle. “My father encouraged me to save after reading the program workbooks and even empowered me by opening an account with our local credit union to help.” Pisey described. She now has over $650 saved in this account and everyone in the family has opened one. Pisey’s father had to say of her journey, “I hope the money she saves every day will help her to study and in reaching university and achieving her big dream.